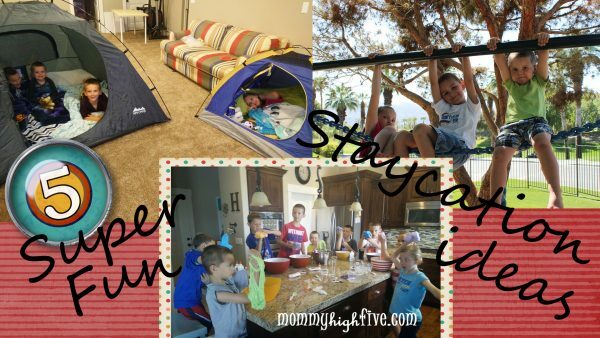 Home » Who Needs a Vacation when You Can Have a Staycation? Mr. High Five and I don’t really like to travel when everyone else does. We hate crowds and long lines and well, just waiting in general. We prefer to take the kidlets out of school and hit the road and go when no one else will be wherever it is that we are going. So that means that when the kids are out of school for spring break, fall break, Christmas, and summer we are usually all at home together under one roof, climbing all over each other driving each other totally crazy, pushing every button of each other’s that we can. I love my children, I really do. But they are all really close in age and they fight like mad monkeys in a jungle that only has one banana left. Some days I would just like to stick a fork in my eye rather than deal with all the fighting and whining. When we are on vacation together or even road trips everyone seems to get along and love each other, and we have a great time even though we are together night and day. Why can’t it be like that when the kids are out of school for a week and just at home? This past spring break we were home together and I was worried that a fork in my eye incident may need to present itself before the week even started. I try to discipline my toddler but like every toddler out there she’s crazy! I decided the week before that I needed to make the next week fun and interesting even though we were just going to be home and not on some exciting vacation. So I came up with some fun “staycation” ideas that saved my sanity and we created some really fun memories. Step 2: In a small bowl, mix together the hot water and borax until the borax is completely dissolved. Step 3: Slowly pour the borax mixture into the glue mixture. Start mixing together and watch the science happen. Keep mixing until water is all mixed in. 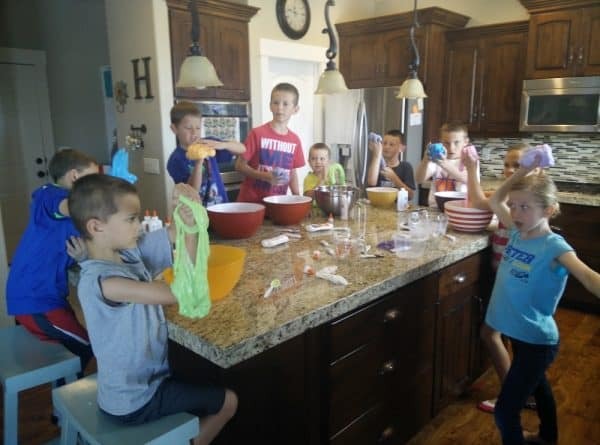 You may want to let the kids mix the borax mix in the glue mix with their hands. Partly because it’s fun, and you’re the fun mom, right? And partly because it mixes together better. Be sure to keep mixing and kneed it like dough until it is all mixed together. Once it is all mixed together, let the fun begin. My kids like to hold it on the edge of the counter and let part of it fall off the edge and have races to see whose hits the floor first. We also got out glass cups. If you set the flubber on top of the glass and then push it in the glass with your fist it makes a “super fart” noise that is hilariously funny!! Play with it for hours. When we were done we stored ours in a Tupperware and it is still good to play with three weeks later. I’m sure you could store it in a Ziploc too. 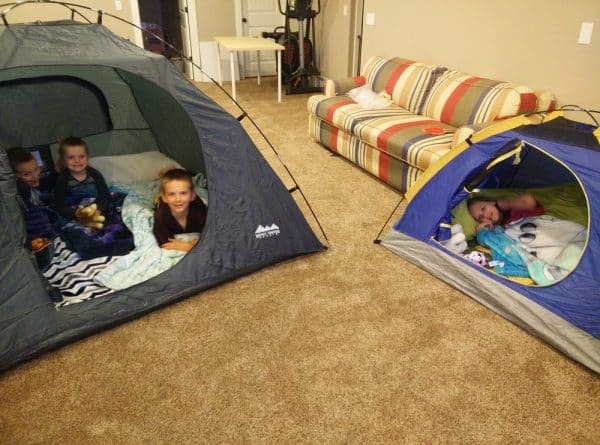 We decided to set up some tents in the basement and let the kids camp out inside. They loved this!! Each night after dinner they would race downstairs to watch a movie or to just hang out in the tents. It was so nice because it gave Mr. High Five and me some more quiet time together, and it gave the kids more bonding time together. Win Win!! We have a huge tent that wouldn’t fit in the basement so we had to set up two smaller ones, a two man and a four man. Each night one kid got to be the “king” or “queen” of the night and sleep in the two man by themselves. It was their very own suite for the night. It was cute to see them get so excited to be treated so special for the evening by the other kids. One night in the tents we hooked up the computer to the TV and they had a Studio C marathon. If you aren’t familiar with Studio C then you need to be! Head on over to youtube.com and follow their channel. They are a clean family-friendly sketch comedy that all ages can enjoy and find hilariously funny!! Their videos are something we enjoy together as a family and now have inside jokes and we laugh about all the time. “Awe Yeah”. 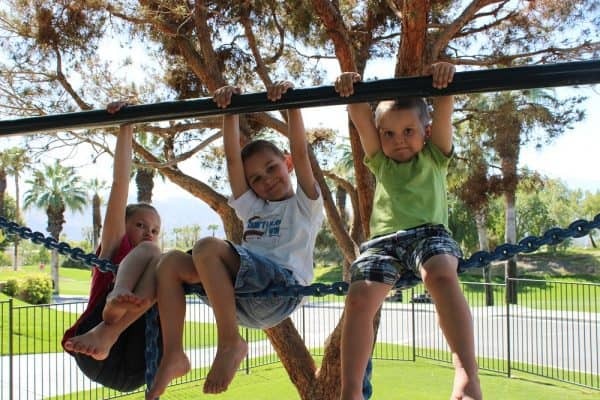 A great idea for a staycation is to head to the park. This may be like a no-duh idea. But what we like to do is since all the elementary schools are out on break at the same time, we like to hit up the other schools’ playgrounds and see what they have to offer. The kids are bored with our school; they are there everyday. And our local parks are always busy. So the other local schools it is. We take Frisbees, kites, water guns, a picnic lunch, and sometimes some friends. So easy, so fun. So I got this idea from my sister-in-law who has some genius mother tips. It works like a charm. One day during this last spring break, we needed our garden weeded so that we could start to get it ready for a project we were going to start in that area of the yard. I hate weeding, so do my kids. But my kids love money, and I love having them do things I don’t like to do. So I paid them to weed the garden. I even let them invite a friend over to help them and I would pay their friend too. Then when the garden was done to my liking, they could take their hard earned money and ride their bikes to the gas station down the street and get a treat. Oh man, my garden area looked so good. I have never seen my kids work so well together. They were out there for two hours and they each earned $3. The big kids rode their bikes to the gas station, and I drove the younger kids there and everyone got to pick out some treats. Everyone loved it and had fun…weeding! Check your local area and see what museums are around you. If you need inspiration here’s a list of free activities. Here in Utah, there are so many fun things for kids to do. Some museums can be pretty pricey and some are totally free. Your local colleges may have museums that are free or very cheap to go to. Here in Utah, we like to go to BYU in Provo and go to the Bean Museum and the Dinosaur Museum. We like to go to the Dinosaur Museum at Thanksgiving Point, the Curiosity Museum at Thanksgiving Point in Lehi, and The Hutchings Museum in Lehi. We like to head up to Salt Lake and go to the Children’s Museum. Those are our regular spots, but there are TONS!! Just off the top of my head there is the Leonardo, The Natural History Museum, The Clark Planetarium, and so many more. Check your local area and take the kids to your local museum; you are bound to learn something and have fun doing it. For more, here’s some additional summer fun ideas. 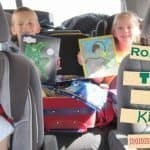 Hopefully, you will find some “out of the box” ideas to help you survive the break with your kids home. Hopefully, you don’t want to poke your eyes out with a fork by the end of the week. My mantras lately have been to let it go and don’t sweat the small stuff. It’s ok to make messes and have a little fun. It’s ok to have a messy house every once in a while and play with the littles. And I’ve learned that it’s not worth stressing about having everyone home under one roof. Just enjoy and make it fun!